OCEAN SHORES, Wash. (AP) — Barbara Patton scans the expansive beach on Washington’s outer coast looking for telltale signs of dead seabirds: a feather sticking straight up, dark colors in the sand, unusual seaweed clumps that could mask a carcass. 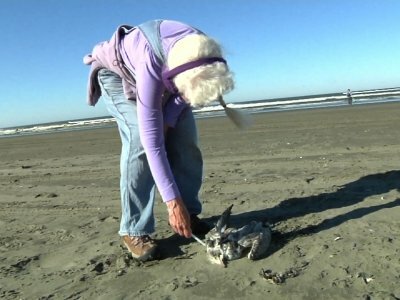 Minutes into the nearly mile-long walk near her Ocean Shores home, she and her husband, Mike, encounter the first of three birds they’ll find that morning. Experience tells them it’s a common murre. But the retired volunteers work through a protocol to identify the species: Eyes gone. Breast eaten. Feet pliable. They measure the wing, bill and other body parts, and photograph the bird, front and back. All of that information is entered into a massive database kept by the Coastal Observation and Seabird Survey Team, or COASST. The long-running citizen monitoring program at the University of Washington tracks dead seabirds as an indicator of the coastal environment’s health. Lately, the data has pointed to bigger and more frequent seabird die-offs. Seabirds spend most of their time feeding and living out at sea, coming to land to breed or nest. But more birds are dying and dying close to shore, Parrish said. Researchers think warmer-than-usual ocean temperatures shook up the ecosystem, favoring warmer species and redistributing the seabirds’ food. COASST volunteers are helping search for clues and identify die-offs faster. In 2014, when Cassin’s auklets, a small diving seabird with blue feet, began washing ashore by the thousands along the U.S West Coast, citizen scientists patrolling their stretch of beaches were among the first to notice it. Patton recalls counting a few dozen dead birds in one walk. Under the program, hundreds of volunteers comb stretches of beach from Mendocino, California, to Kotzebue, Alaska, each month looking for carcasses that have washed ashore. Since 1998, they’ve recorded nearly 76,000 dead birds. Combined with other large-scale data from satellites and other surveys, Parrish said, it can provide high-quality data over a geographic scale not attainable any other way. The data is used to track seasonal, short-term and long-term changes in seabirds, revealing patterns about where and when certain species die. There are seasonal peaks, after breeding seasons when exhausted parents and chicks wash ashore or when seasonal migratory birds get stranded. The data amassed has also been used by other scientists and resource managers to monitor bird health and other research. Kristine Bovy, associate anthropology professor at the University of Rhode Island, used the modern bird data to help evaluate how indigenous people in the Pacific Northwest may have scavenged to find bones and other natural resources on the coast hundreds of years ago. “It helped us to be able to test our ideas in the past about whether people may be scavenging bird carcasses from the beach,” she said. Parrish said there can be skepticism about citizen science. She designed the bird surveying program years ago so information collected could be independently verified - by photographs, measurements and other paper records. On a recent clear day not far from where the Pattons collected their carcasses, Jeanne Finke, Susan Kloeppel and Bob Witt fan out across the beach. Brown pelicans and seagulls soar above crashing waves. Little sandpipers scurry and peck in the wet sand. But Finke and her team are more interested in the birds that are dead than alive. “It’s an early warning system for the ocean,” said Finke, a retired Boeing worker. “I think some people think we’re odd for doing it,” she added, but she likes learning about her environment and isn’t afraid to put on gloves and rummage for dead birds. Before long, she and the others line up five carcasses on a massive log and get to work. They record where on the beach the birds were found, whether the wings or chest are intact, what kind of bill and foot the bird has. The records and photos they take are sent to COASST’s scientific expert to be verified. Most of the time, the citizen scientists nail the ID.